So I lied. There will not be three book reviews this week. 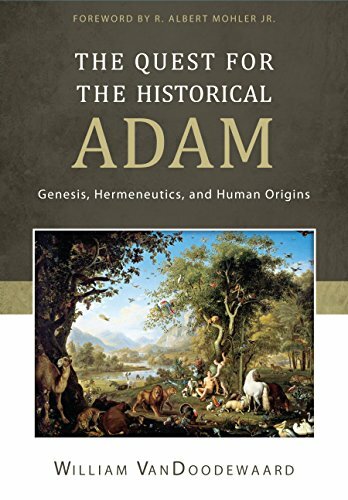 The Quest for the Historical Adam by William Vandoodewaard has not been finished. A legit review will come in the future but I have some current talking points I would like to address. This book, and its particular evangelical paradigm, have an important role in the creation discussions. Let me say that the books is rather massive. It is quite literally a tome of church opinion on creation and the historicity of Adam. An early chapter blows straight through 15-25 Scriptural passages with little exegesis before diving deep into theological commentaries down through the ages. This is not to diminish the role of the Scripture in the conversation but it certainly is not the center point of this book. This means the book is rather impressive and helpful as an informational resource but it does not add to the discussion. One of the major things that strikes me is how often the church fathers wrote about Genesis in polemics against non-Christians. These passages of Scripture were being aimed at the philosophical consensus of the time. For the majority of church history the prevailing philosophy was that the universe was eternal. Platonic influence also held that everything was made of eternal matter. So the early church in discussing with these worldviews stressed greatly the ex nihilo idea. This is important because the idea of an eternal universe is irreconcilable with Christianity. Genesis as history made for outstanding arguments against pagan philosophy. But modern science rejects the eternal universe theory. So also, many less literal views of Genesis 1-3 in evangelical circles do not negate ex nihilo. That these different perspectives share an enemy is telling. My point is that despite the value of knowing what the father's taught it is important to know what they were rejecting. Unfortunately, The Quest for the Historical Adam does not account for the full context of these writings. Science has sharpened the church's interpretation of crucial passages throughout its history. It is fair to say that any science that would challenge a young-earth were unable of being communicated until the last 300-400 years. It is important to note that geological evidence pre-dating Darwinism had already led many Protestants to adopt an old-earth approach. Now, the church can begin to question its own exegesis. Though apologetic against secular philosophy is important, it can not be the driving force of exegesis.